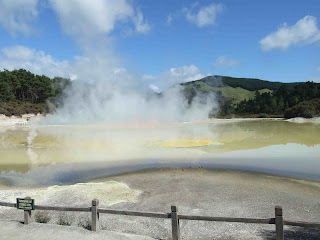 Then I went for a 3km walk around the thermal area. It was amazing. At the heart of the park is The Champagne Pool. The spring is 65 metres in diameter and 62 metres deep! Its surface temperature is 74 degrees Celsius and had random bubbles caused by carbon dioxide. 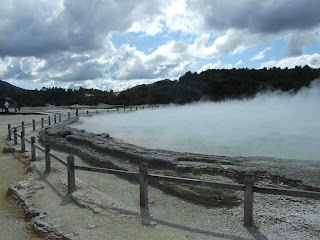 The pool is only 700 years old and was cuased by a hydrothermal eruption. There are lots of different minerals in the pool including gold, silver, mercury, sulphur, arsenic, thallium, antimony and more. 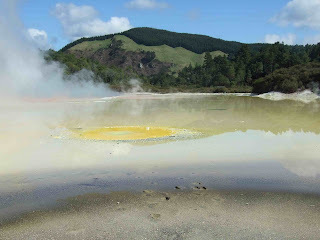 The various edges of the pool are caused by the settling minerals and the tilting of the pool caused by earthquake activity. Avis Rental - happy customer!